Climate-smart agriculture could be the only way to feed our planet as climate change makes it impossible for us to farm the way we do now. But what is it? There’s a pretty fair chance you’re going to start hearing a lot of references to “climate-smart agriculture” in the next few days (and very likely into the future, even after the stories of arrested protesters die down). It’s a complex term, especially in that it’s very easy to understand in the big picture and gets progressively more vague and confusing the more you try to learn about it. But! It’s also probably going to become a minor catchphrase, so let’s get into some specifics on what it means and why you should care. Climate-smart agriculture is a sort of overview concept originally put forth in 2010 by the UN’s Food and Agriculture Organization. Up until now it’s been a bit vague, a general idea about adjusting all forms of agriculture (“farms, crops, livestock, aquaculture, and capture fisheries”) to better adapt to a changing climate. It isn’t a set of guidelines, or even recommendations, really; it’s more of a philosophy that various global organizations are attempting to push. That philosophy: farming needs to involve significant investment, especially money, in developing technologies that can assist farmers as the climate changes; in transitioning farmers from current strategies to new climate-aware ones; and in encouraging farmers to abandon or lessen reliance on methods that increase greenhouse gas emissions. It’s necessarily vague because the needs of a taro farmer in a South Pacific island that may not exist in 20 years is different from the needs of a corn grower in Iowa or a rice farmer in Laos. The climate isn’t changing evenly throughout the world, and different places have wildly different needs. But everyone agrees that climate change has and will have a disastrous or at least dramatic affect on agriculture. In general, the poorest and hottest countries will be the hardest hit; one typical study indicated that yields of maize in southern Africa could drop by more than 30% by 2030. Crops in tropical regions, it’s now believed, will be subject to droughts as well as temperature increases, which could be deadly. Many crops, like maize and rice, are already nearly hitting their tolerance for heat in regions of Africa and South America. This New York Times article lists some notable crops that’ll be adversely affected by climate change, from olives to tea to shellfish. Everyone agrees that climate change has and will have a disastrous or at least dramatic affect on agriculture. In colder countries, the outlook isn’t as grim; European corn production could rise as temperature hikes actually increase its growing season. But that isn’t exactly a solution; Europe isn’t suffering food crises (even if the potato eventually has to be replaced by the banana), and shipping new European excesses to developing nations that are no longer able to grow their own food would have tremendous infrastructure obstacles. We already grow enough food to feed the planet; it’s infrastructure and transportation that leaves people hungry. Jeema Purty, a farmer in the Indian state of Odisha, is growing a drought-tolerant rice variety known as Sahbhagi dhan, meaning “rice developed through collaboration.” When Jeema started growing it, her harvests improved greatly and she was able to sell surplus grain at market. She re-invested her rice earnings and began growing vegetables, providing a more nutritious diet for her children. 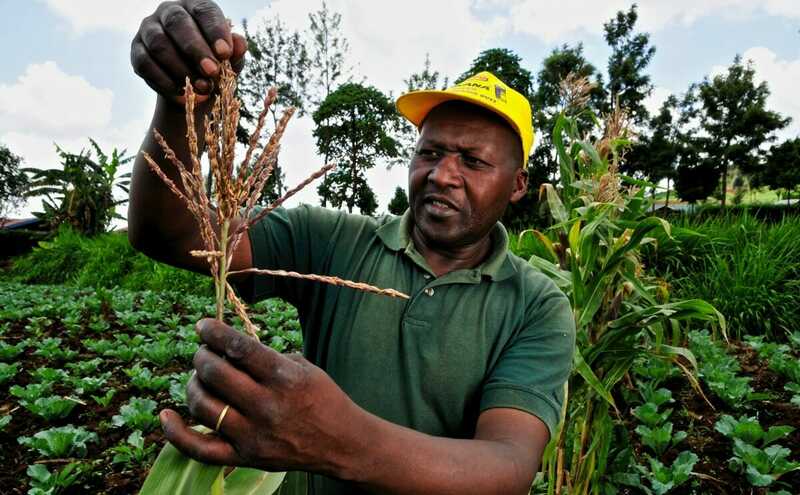 In Africa, drought tolerant maize developed by CGIAR and its partners has increased farmers’ yields by 20-30 percent, benefiting over 20 million people in 13 countries. In the Sahel, a climate-smart agroforestry practice that integrates food crops with trees that draw nitrogen from the air and transfer it to the soil has increased harvests by up to 400 percent, while capturing carbon and reducing greenhouse gas (GHG) emissions. CGIAR isn’t actually associated with the UN, the EU, or any other government, but is instead a group of 15 research centers housing scientists focused on assisting farmers in the tropics. The group works closely with the UN, individual countries, private businesses, and non-profits, but isn’t a division of a larger organization. CGIAR has been around for awhile, but today the group announced a huge change in their tactics and strategy: they will be committing 60% of their operating budget to creating climate-smart agriculture plans for 500 million farmers around the world. CGIAR is a major part of this week’s UN Climate Summit in New York, hosting talks to discuss climate-smart agriculture. This is, in large part, what the protesters that flooded Wall Street earlier this week were fighting for.